I have no problem with ending it, I was not the one that brought you into the conversation, Seagoatdeb, or called you my 'foe' (what a ridiculous notion!). As to pm's, I rather not. I have received a few that cannot be construed as anything else than harassment so, please, both of you, block me and don't send me any pms. Pajarita wrote: I have no problem with ending it, I was not the one that brought you into the conversation, Seagoatdeb, or called you my 'foe' (what a ridiculous notion!). As to pm's, I rather not. I have received a few that cannot be construed as anything else than harassment so, please, both of you, block me and don't send me any pms. There is no way to block you, and if someone sent you harrassing pms let a moderator know. Since you do not want pms I will tell you this here, you can set anyone you want to a foe and then you dont have to see their posts unless you want to. I already reported it and by all means, set me down as your 'foe' so you don't see my postings. I didn't know where this word came from and it made me think of Batman and Robin and the Penguin which was quite ridiculous. Pajarita wrote: I already reported it and by all means, set me down as your 'foe' so you don't see my postings. I didn't know where this word came from and it made me think of Batman and Robin and the Penguin which was quite ridiculous. I wasn't calling you my foe or enemy btw I was just meaning that as the option it gives. Guys, none of this matters, you were asked to not PM her any more, so please respect this and do not PM her any more. Let me try one more time to put this so that it is easily understood by everyone. 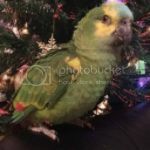 This is a forum about parrots and about helping other people in better understanding their birds and how to care for them as well as training them so as to increase the pleasure of human/ parrot interactions for both the human and parrot. Although there is little attempt at controlling what a person says or how they say it, Respect and consideration of other peoples feelings is strongly encouraged. We are all expected to be adult enough to know and understand that sometimes misunderstandings happen. There are many possible reasons for these misunderstanding ranging from the wording that was chosen, typographical errors of even the misunderstanding of the other persons intent, sometimes these are caused simply because we are accustomed to seeing a persons face or hearing the tone of their words, both of which are impossible with the printed word. If there is a misunderstanding simply and politely ask for clarification instead of starting an argument. If you are involved is bickering, name calling or other personal type remarks, you are in the wrong. It does not matter how it started you can choose to not respond to poor behavior from other members. Fighting on the forum is not allowed. Google images just show the same as whats on the website and they dont show them 'true' if you get what I mean. I guess noone else has already purchased one on here. Here is the pic I found....http://www.scarlettsparrotessentials.co ... oot-medium. What concerns me with the toy, is Scarlett toys is not saying what metals are used so there could be lead or zinc. and with the bell, the clapper could be dangerous. Maybe you could email them and find out before you purchase and make sure its parrot safe.